Diamond Distribution also owns a toy maker or two whom they use to license and create a variety of action figures and toys under the name Diamond Select Toys. And you know what? Much like the distribution arm, this division is irritating me! First, a lot of their stuff isn't the greatest quality. Especially the action figures. Often the faces don't look anything like the character they're supposed to resemble. Check their web site if you don't believe me. Then this week we find out that they decided to completely change the packaging for the Marvel Mini-mates. We had a space cleared out for the box that we thought they would come in, but they didn't come in that master box. Instead they were just in a plain cardboard box and inside were the boxes for the pairs of figures, much bigger and with a hook for hanging them. Granted, this is a nice system - but we have grown accustom to the way they were before and having them carded differently forces us to put them in a different spot, away from the others. Then there is the case make-up of their action figures. Usually retailers have to order a full case of any figure set they make. Now, instead of having 4-6 different figures in a case, Diamond Select Toys will have a grand total of 3 different figures in a case, and one is a variant figure and there will be only one variant per case. (In fact, another annoying thing is that they ALWAYS feel the need to have a variant - even with Mini-mates.) Take the Star Trek figures pictured. Those are one full set! 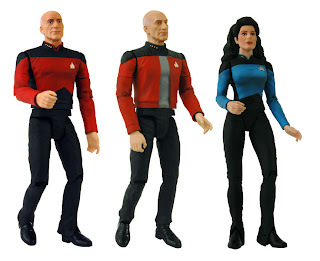 Those three, and two are Picard - a regular and then a variant. The other thing they like to do with figures sometimes is to have more of the obscure figures than the popular ones. Now how is anyone supposed to sell a case made up like that? Take, for example, the Battlestar Galactica figures pictured. That's Lee Adama, Six and who do you think that other one is?? Any Guesses? Hotdog. Yeah, that's what I said! WHO is going to seek out a Hotdog action figure? Especially when it hardly looks like him to begin with. They are also infamous for lateness. I know... you're shocked by this. But yes, they often solicit a product for a date and it arrives several months later. And, to top it off, instead of exclusively making their product available to stores, they also sell their products on-line. And sometimes they have more available on their on-line store than they have available for purchase for retailers. What I mean is, it will show an item is out of stock when we try to reorder it through our Diamond account, but meanwhile I can see it showing as available on the Diamond Select Toys website. Like I said, we don't get much Diamond Select stuff for the reasons above. However, we do carry the mini-mates (awesome Marvel Zombies set just came in) because they're always pretty cool. We have a couple of the Star Trek ships because they're popular and we don't have to buy a case of them. There are a couple of others we carry because Diamond Select has the license and the licensed product has a fanbase that we want to cater to - like Stargate and Battlestar Galactica. I just wish that DS wasn't so irritating! See, if Steve Geppi gave me a job this is another thing I'd work on fixing. The SG-1 line they seem to do a similar thing, which was very irritating. The first SG-1 line had three variants on O'Neill. I wanted Carter, dammit!! Ahem...geekiness aside, I totally understand the frustration. I don't think the toys sell well enough to do what they do, but then, Diamond doesn't have to worry as much since once the retailers have them, that's it. I think we still have several Thors and such, whereas the main cast is sold out. It makes some sense to spread these out, having some popular and some less popular characters in each series. But often the mix is heavily weighted to these obscure characters and only a couple in the case of the characters you could actually sell. It drives me nuts!